Electric vehicles are becoming more widespread throughout Minnesota. Drivers who may have previously ruled out plug-in hybrid or all-electric cars are now seriously considering this transportation option as technology advances allow for longer driving ranges and lower sticker prices. Electric vehicles provide many benefits to our members, our communities and the environment, including decreased tailpipe emissions, less petroleum consumption for increased energy independence, and overall fuel cost savings. Connexus Energy offers members incentives and benefits for making the switch to electric vehicles, including a rebate for the installation of a Level 2 charger, which is powered by 100 percent wind energy at no extra cost, and time-of-day rates. Learn more about electric vehicle charging and time-of-day rates from Connexus Energy. Many drivers are hesitant to purchase an electric vehicle because of “range anxiety” – the belief that one charge will not be sufficient to last the day. Studies show that most drivers in the U.S. drive fewer than 60 miles on weekdays; advancements in electric vehicle batteries allow for increased driving range mileage that accommodate those needs. Charging equipment for plug-in electric vehicles (PHEVs or EVs) is classified by the rate at which the batteries are charged. Level 1 chargers offer a range of 2 to 5 miles per 1 hour of charging. The charging cord comes with the vehicle and plugs into a standard 120V household wall outlet. Level 2 chargers provide 10 to 20 miles of range per 1 hour of charging. Level 2 chargers are purchased separately from the vehicle and can be installed at your home. The charger and installation can cost between $700 and $3,000. A Level 2 charger requires hardwired or plug-in electric vehicle supply equipment (EVSE). DC Fast Charging units allow for 50-70 miles of range per 20 minutes of charging. These units are typically available for public charging at commercial charging stations, and usage fees generally apply. 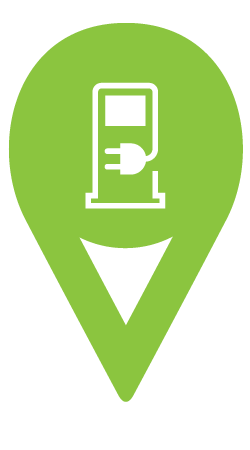 In addition to the charging stations located at Connexus Energy, PlugShare, www.workplacecharging.org, and www.greenlots.com can help you locate a charging station wherever you go. Install a Level 2 EV charger and receive a $500 rebate. Rebate amount is $500 per qualifying Level 2 (240 Volt outlet) EV charger. Must be enrolled in Time-of-Day or Off-Peak rate programs. EV charger must be installed in the Connexus Energy service territory. Eligible for plug-in electric vehicles (PEVs) or plug-in hybrid electric vehicles (PHEVs) only. Hybrid electric vehicles (HEVs), such as the Toyota Prius, are not eligible. Download and complete the Connexus Energy Level 2 EV Charger Rebate form. Connexus Energy supports efforts to protect the environment, including the adoption of electric vehicles. Our EV Time-of-Day (TOD) Program offers an affordable rate to members who purchase an electric vehicle to meet their charging needs. Two categories of electric vehicles are eligible for this program: plug-in electric vehicles (PEVs) and plug-in hybrid electric vehicles (PHEVs). Hybrid electric vehicles (HEVs), such as the Toyota Prius, do not qualify. The time-of-day rate offers members the most hours of charging in a week, while still providing an electric rate at almost half-off the regular residential rate. The least expensive rate is available fifty percent of the time. This option requires the installation of a separate, sub-metered circuit. Members can choose this rate for their whole house or for their electric vehicle only. Intermediate Period* (38%) 10.8¢/kWh 8 a.m. - 4 p.m. Peak Period Summer* (4%) 45.5¢/kWh 4 p.m. - 8 p.m. M-F June-Sept. There are no peak periods on weekends or the following holidays: New Year's Day, Memorial Day, Independence Day, Labor Day, Thanksgiving, and Christmas Day. Enroll in the program online. Contact Connexus Energy to schedule a date and time to pick up the required metering equipment. Contact Connexus Energy at 763.323.2650 for a final inspection. TOD rates and wind energy enrollment will not apply until the final inspection is complete. The most economical way to a full battery is to charge your vehicle during off-peak hours, when the cost for electricity is at its lowest.With the Off-Peak Charging rate, you’ll pay 4.45¢ per kWh for charging between the hours of 11:00 p.m. to 7:00 a.m. Charging on this rate is not available other hours of the day. Depending on the installation, additional equipment (such as a sequencer box) may be required. Ask your contractor for details. Have a state electrical inspection completed within 30 days of metering equipment installation. Contact Connexus Energy at 763.323.2738 for final off-peak inspection. Off-peak rates will not be applied until final inspection is completed. Reference general terms of off-peak programs. Enroll in the Storage Program - Off-Peak Charging. We’ve taken a bold step – one no other energy provider has taken. Along with our power supplier, Great River Energy, we’re powering your electric vehicle with 100 percent wind energy for the lifetime of that vehicle, at no extra cost. You’ll still have to pay for the energy you use, but you’ll be able to do so knowing that when you go electric, you’ll always be going green. How do you know you’ll be getting 100% wind energy? Energy comes from all kinds of sources: wind, natural gas, coal, and more. Once it hits the power grid, there’s no way of telling where it came from. However, when renewable energy is added to the mix, a renewable energy credit (REC) is created that embodies all the environmental benefits of that energy. When you enroll in the Time-of-Day or Storage Program, we’ll dedicate wind energy RECs on your behalf, completely offsetting that energy used to power your electric vehicle. A certificate of wind energy will be mailed to you within 6-8 weeks after enrollment.